Suastus gremius gremius, a buff-brown skipper butterfly! 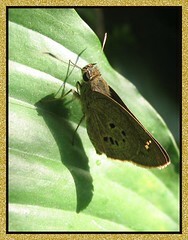 Though a relatively small and common skipper butterfly, all the same it is beautiful in my eyes! I first found it last April in our garden, darting from plant to plant in quick succession until it finally rested on a hibiscus leaf. How excited I was to have succeeded in capturing this shot. Now, I’m extremely happy that it finally has a name, Suastus gremius gremius. And, to learn that they feed on ornamental Palms makes me wonder whether our palms such as the Lady Palm (Rhapis Excelsa), Macarthur Palm (Ptychosperma Macarthurii) and Manila Palm (Veitchia Merrillii) are attracting them to frequent our garden? That it did recently – about 3 days ago!! I’m delighted and overjoyed to have captured a few more shots of this pretty butterfly. Seems to me, I’m not the only one besides my beloved spouse who is captivated with the beautiful Agapanthus (Lily of the Nile) that was recently added to our garden! 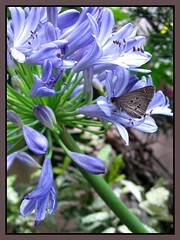 This Indian Palm Bob also found the blues of Agapanthus as irresistible!! Such a sweet little skipper butterfly! Suastus gremium gremius has wingspan about 3-4.5 cm and dark olive-brown upperside with seven semi-transparent whitish-yellow spots (3 in the apex and 4 scattered). Its greyish brown underside is covered with buff scaling and 5 well-defined black spots. 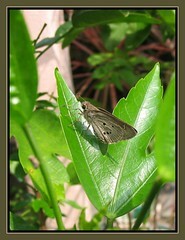 As with most skippers, it has a quick flight and rests with its wings folded closed. It loves the sun and is known to frequent low-growing flowers such as Lantana, Aztec Marigold, Asters, etc. besides ornamental Palms. Food plants: Mainly ornamental palms such as Calamus, Caryota, Cocos nucifera (Coconut Palm), Phoenix canariensis (Canary Island Date Palm), etc. Distribution: India and Sri Lanka to Thailand and Southern China, Malaysia, Singapore and the Lesser Sunda Islands. Attacus atlas, the largest moth in the world!